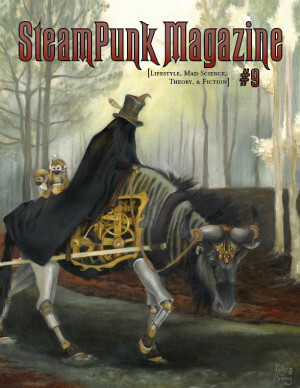 Indiana Jones and The Fifth Element, only with a kickass female lead and plenty of contemporary Steampunk twists. This is a crisply written, well-paced book that will keep you turning the pages, so don’t start it if you’ve got to be somewhere else urgently! Chrystal is, as the tagline says, a 188 year old bisexual cyborg vampire. None of that is quite what it suggests in practice (except the bisexual bit). 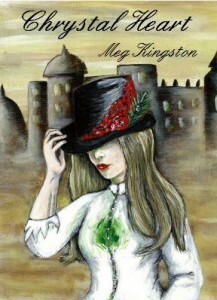 The unravelling of the mystery around the enigmatic central character is much of the joy of this story, but Meg Kingston knows that a flash of ankle can be more tantalising than a bare leg, and teases out little glimpses of the backstory without ever letting us become too familiar with her heroine. This makes for an enjoyable read. There’s nothing worse, for me, than writers who have to lay everything bare and explain it all tidily. Expect to spend a lot of time afterwards wondering what was going on behind the scenes in the tale. The plot is wholly satisfying, but isn’t handed to you on a plate. There’s some really interesting science in the book, along with some great characters, determined villains, action, love interest (too much love interest for a child-reader, but not that explicit). Also there are charming endnotes to let you know what came from where in terms of how science meets fiction. The ways in which Meg has made this both a modern book set in the here and now and an unequivocally Steampunk book are delightful, although I won’t explain further, to avoid spoilers. I can very much recommend this as a most entertaining read. It looks like you can get it here.